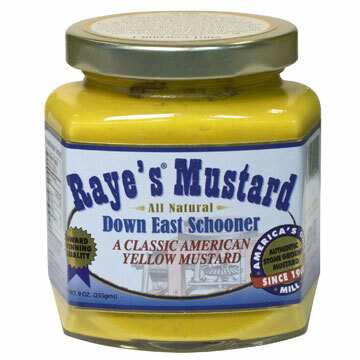 Down East Schooner – This is a gourmet yellow mustard, very tasty. Martha Stewart wrote a whole piece in Living magazine so I had to try it. Rayes has been making this mustard the old fashioned way since the 1900s, Raye’s Mustard Mill is North America’s last remaining traditional stone-ground mustard mill.. and they really got it right with this mustard, its not too strong – but not too spicy, just mild enough to not overpower your hotdog/hamburger. It won the 2006 Napa Valley World-Wide Mustard Competition’s Gold Medal as the world’s best classic yellow mustard. 4.00 for 9oz on http://www.rayesmustard.com/ so its also a great price.